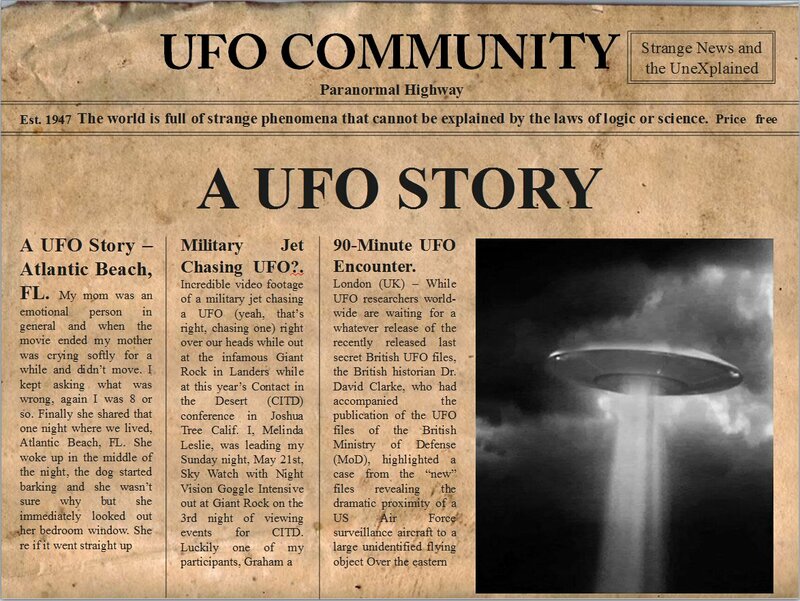 A UFO Story – Atlantic Beach, FL. My late mother and I and her friend went to see Close Encounters of the Third Kind in 1977 so I was like 8 years old. My mom was an emotional person in general and when the movie ended my mother was crying softly for a while and didn’t move. I kept asking what was wrong, again I was 8 or so. Finally she shared that one night where we lived, Atlantic Beach, FL. She woke up in the middle of the night, the dog started barking and she wasn’t sure why but she immediately looked out her bedroom window. She claims to have seen a very large UFO very similar to the one in the Close Encounters movie. Her words where something like she saw a spacecraft hovering above the trees that looked “exactly” like the UFO in the movie. She said in the middle of the night she was woken out of a dead sleep, it got really windy outside, then very calm and still. Apparently even the dog stopped barking. She saw the UFO hover for a few minutes, she said she really wasn’t aware much of the time. She said when it left, it was there and then was like almost instantly gone, she wasn’t even sure if it went straight up vertically or horizontally. It had many colors and the colors where changing, pulsating sort of. She said the power went out which was very weird to her because it was very bright outside even though it was 3am or so in the morning. We lived a block from the beach just for reference. It wasn’t hovering over the water but the land just West of the ocean. I have no proof but I’ll always remember that story. My mom was a straight shooter and she never, ever saw another UFO, at least she never mentioned one to me. I’ve given all the details I recall, it was about 40 years ago but it’s not something you forget. She passed away about 13 years ago so I can’t really ask her anymore. The oddest thing I took away from this was how much the scenario was similar to the movie. Like if she saw the movie first then one night had this experience I could easily understand how she had these images in her mind, from the movie obviously. However, this event happened prior to the movie and she was so moved at the end movie because of how eerily similar her encounter was. Something else to add, she mentioned she worried about getting visited later by two guys in suits asking her about what she saw. I was too young to think to ask about “two guys in suits” however as I got older I imagined this was some sort of Men in Black reference? Anyhow. I’ve never told anyone this story. There are no pictures and no proof other than my mother’s story after she stopped sobbing at the end of movie. Triggered memories can hide deep within. Then all of a sudden, the person is flooding with sensations, memories, smells, tastes, etc.